I've been working so much today I've hardly had time to blog. But, I had a brilliant idea while eating a bag of Planters Honey Roasted Peanuts (lunch, aquired for free from Eric Jay about a month ago). 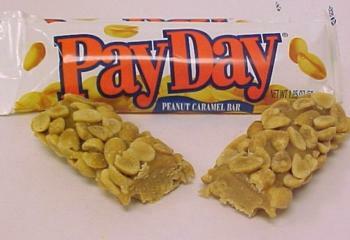 Perhaps Payday shoudl make a honey roasted candy bar. Now lord knows this could lead to a health crisis for me but oooh wouldn't it be sweet? yes. Bonnie "Prince" Billy and Matt Sweeney "Bed Is For Sleeping"
Wow, remember this album. It's a down beat number. There all down beat numbers. Bonnie busts out the falsetto.